Vermicomposting , a simple biotechnological process of composting where certain species of earthworms are used to transform organic waste into a nutrient-rich fertilizer . 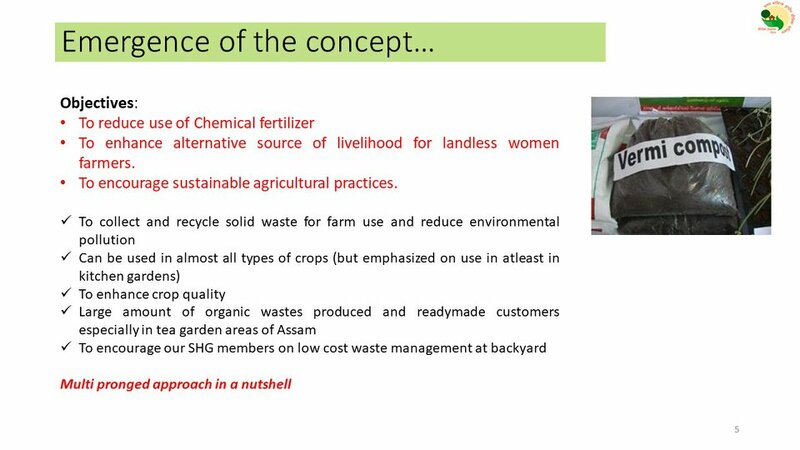 ASRLM has adopted it as a good practice that can be replicated as a income generation activity of SHGs. 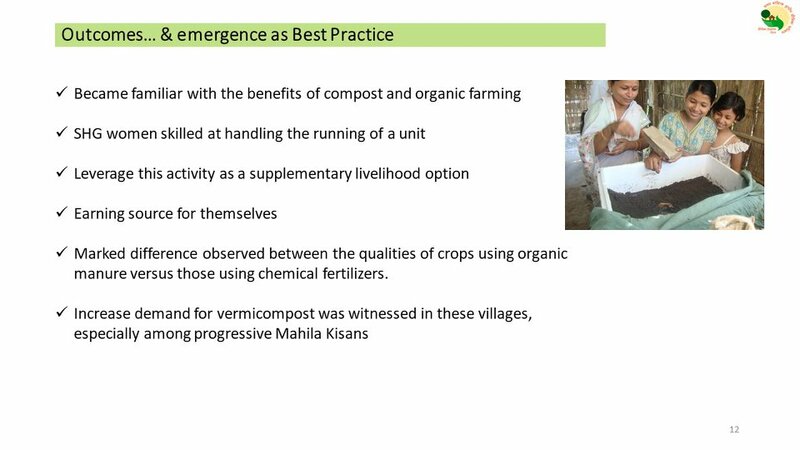 ASRLM in association with Krishi Vikash Kendras and MGNREGA is marching ahead together towards capacity building on organic fertilizer and henceforth paving ways of production and usage of Vermicompost . Rupa Goswami, a member of Manasha SHG, under Karunabari Block of Lakhimpur started a small dairy Unit in her home coming into a ASRLM- SHG fold . At present, she owns 7 dairy cattle (Jersey) from which she is able to produce 40 litres of milk per day. Apart from villagers of her locality as buyers, she also sells Milk and Milk products like curd, paneer to various hotels in the small township of Laluk, Lakhimpur. She sells the fresh milk @ Rs. 50 per litre. She maintains her livestock with utmost care by providing them with good quality feeds, timely Medicines and Vaccinations and maintaining the hygiene quotient of the Cattle and the Shed. 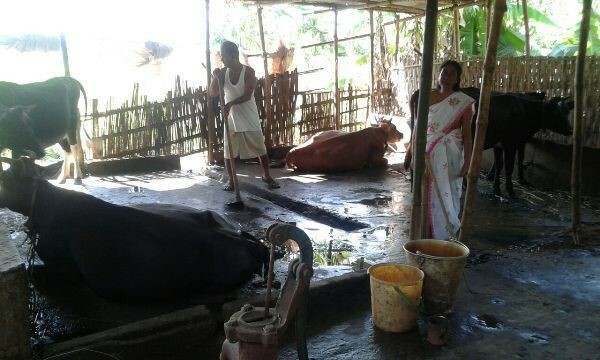 After incurring all the expenses related to her 7 cattle, Rupa manages to make an income of Rs. Rs.29,000/- to Rs. 31,000/- per month. 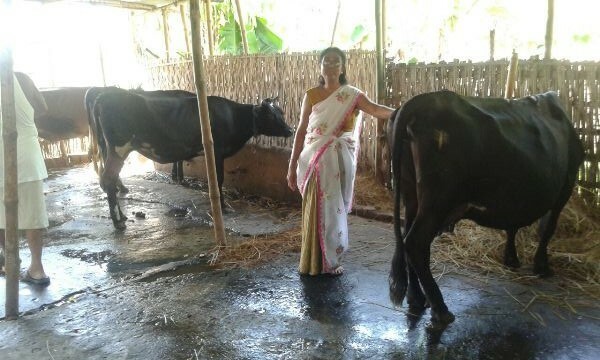 This lady who started with a simple livelihood option which she could do by herself, now can confidently engage casual workers and labourers to look after her cattle. This venture which gradually evolved into a small dairy unit became an inspiration for many like her in her locality. Rupa aspires to increase her production from 40 litres to 150 litres per day because her dairy products has market demand at Laluk. I believed in myself, and thrived for more. Today, with ASRLM assistance I emerged from ordinary village women to a owner of a small dairy unit. 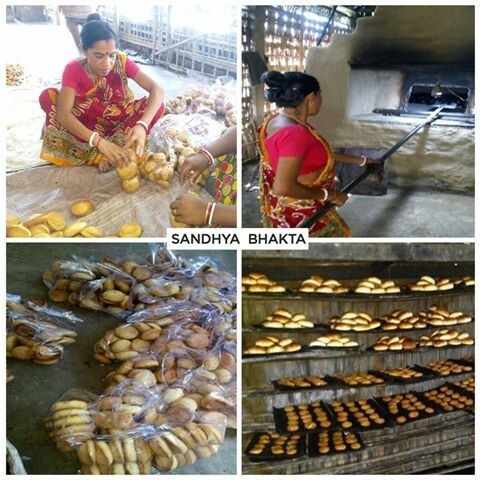 Sandhya Bhakta a member of Abha SHG, under Karunabari Block of Lakhimpur owns a bakery unit making an income of Rs. 32000/- per month. After coming into the SHG fold of ASRLM, Sandhya realized that she has ample scope of giving her family business a growth. She realized that her physical contribution and financial assistance can make her a productive member of her family and thereby she will given a due recognition and status. ABHA SHG of which Sandhya is a member had received Revolving Fund (RF) Community Investment Fund (CIF) and also Bank credit of Rs. 1,50,000/-. The SHG also did savings of more than Rs. 40000/- since their formation in 2012. Sandhya took a Loan of Rs. 60,000/- from the SHG to set up the additional of Bakery Unit . She also invested an amount on the purchase of ingredients. Bakery products made by her already had a huge demand , all she needed was to increase the supply which could only happen if she would invest on her unit, ingredients and engage more people in her small unit. The loan helped her in this prospect and gradually she was able to move from retail business to capture wholesale market . She has also engaged 4 persons in her bakery unit providing them monthly remuneration of Rs.3000. Thus she became a small entrepreneur in her village inspiring her fellow village women. I have fulfilled my dream, which would not have been possible if I was not in the group. ASRLM has not paved my way to success but also helped in establishing my identity and value for work. TRADE OF SKILL TRAINING RECEIVED: ‘Customer Relation Management- Domestic Voice BPO domain’. Gita Kurmi comes from a small village in Geleki, Sivsagar with big dreams of making her own identity. Completed her training from M/S NIIT YuvaJyoti, Dibrugarh centre in ‘Customer Relation Management- Domestic Voice BPO domain’.A DDU-GKY Mobilization Camp came as turning point in her life when she got to know about the Skill Training imparted under DDU-GKY programme which is absolutely free. For a girl with poor economic condition and limited resources training in a PIA inder DDU-GKY not only developed her personality but at the same time opened doors of career opportunities. 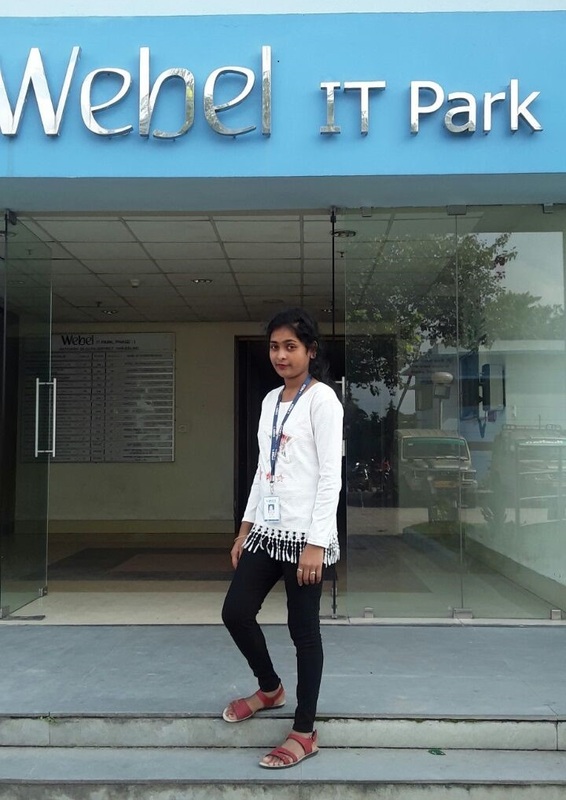 After completing Gita Kurmi was offered placement in Hinduja Global Services, Siliguri where she joined in May, 2017 with an initial salary of Rs. 7,200 per month. Now she receives a total salary of Rs. 17,893. Mrs. Monimala Bora Mohan is a house wife from Mohmaiki Ahu Gaon, Bokakhat and helping her husband in traditional cultivation. Her husband works in a Tea Garden, hence and has the basic knowledge about plantation and farming. For enhancement of their household income they started a Poultry Farm with 200 chicks but unfortunately incurred loss because of the lack of knowledge in preventive steps. RSETI Intervention came forward as a turning point in their ives when she joined a training on Poultry Farming in RSETI UBI Golaghat. The Training course included precautions to be taken in every step of Poultry farming, best quality varieties, market potentiality and economy of Poultry farming business which is essential to get success in this business. 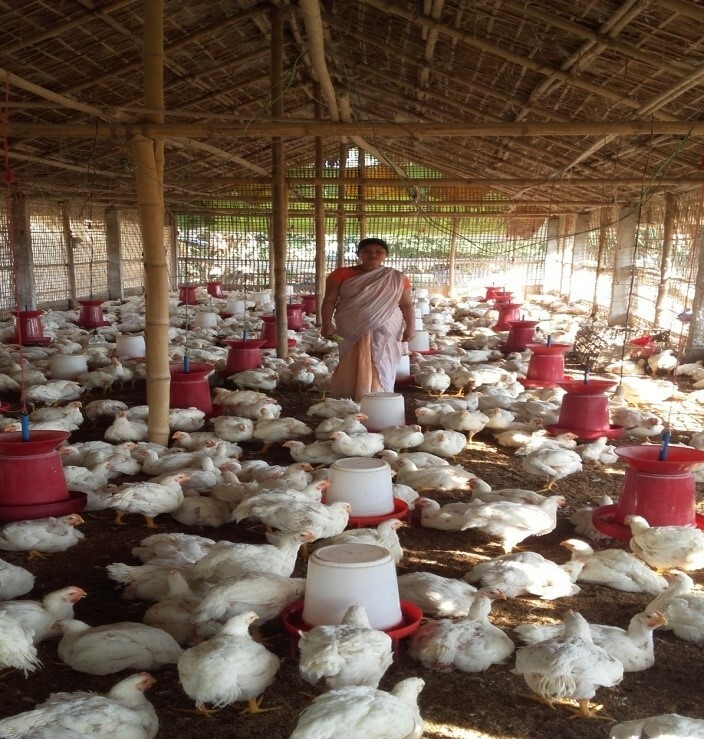 After completion of the training and a clear idea of the Dos and Don’ts of Poultry Farming Mrs. Monimala Bora Mohan expanded their farm to 1300 chicks in the month of November 2016 targeting to sell in the ensuing Bihu Markets in January 2017. This time she lost only 80 chicks and remaining 1220 grown up and became a size of 2.8 Kgs each when sold to wholesale and retail market @110/- and Rs 200/- per kilo respectively. Now she is earning an average profit of Rs 20000/- after all expenditure from approx 1200 chicks in each batch. Babul Debnath comes from economically poor family Basugaon, Bhutiapara. The poor economic condition did not allow him to pursue formal education beyond Class X and thus closing doors of Job opportunities. They only way he could earn bread for his family was by means of starting up something on his own . Some of his acquaintances informed him about RSETI and suggested him to undertake the Free training under SBI-RSETI, Chirang. He enrolled himself for training in Dairy Farming and underwent a 10 days with full interest and dedication. After receiving the training he applied for loan of Rs.225000/- from AGVB, Basugaon Branchto to start a dairy business. He owns Milk Cows (Jersey) and supplies milk to the tea stalls of the area and his neighbors. Initial days included struggle with finances but gradually he overcame all of them through hard work and perseverance . 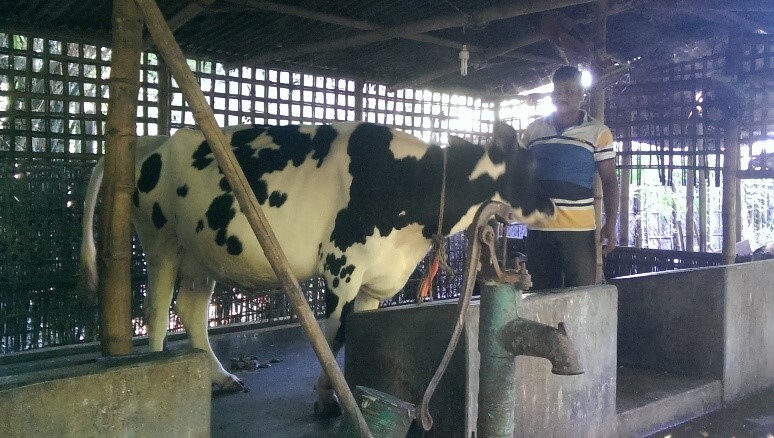 Babul Debnath presently supplies 30 to 40 litres of milk every day in the market earning Rs. 60,000/- to 70,000 every month approximately. With the earnings, he regularly repays his EMIs. He is keen to expand his business after total repayment of loan and proclaim himself a small entrepreneur of his locality.